1. My favorite subject in school was ____. 2. An extracurricular activity I participated in was _____. 3. I want to learn____. 4. It takes courage to _____. 1. My favorite subject in school was definitely not math. I loved English class. 2. An extracurricular activity I participated in was volleyball and cheerleading. 3. I want to learn how to do HTML. 4. It takes courage to speak up. 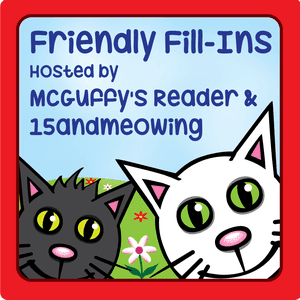 Thank you for participating in the Friendly Fill-Ins! I also really enjoyed English courses in school. I have next to no skill with technology, but my sister is currently taking online courses on html and coding. She's really enjoying learning it. Have a beautiful day! Thanks for stopping, Menagerie Mom. I can do computers, but never learned HTML. That is terrific your sister is learning. Maybe on the class. Thanks, and thanks for commenting, Ellen. You will love doing HTML. It really is not as difficult as it seems. I don't know if it is still around but I learned from a very excellent FREE resource called Web Monkey. A web search will probably bring it up right away. Have fun and a blessed week. Thanks for the information, David, and thanks for commenting.